In general, Brimfield is a fun place to be. Dealers are doing what they love and shoppers are doing what they love. Most transactions, including the haggling, go smoothly and everyone walks away happy. Shopping in Brimfield is one of my favorite things to do. 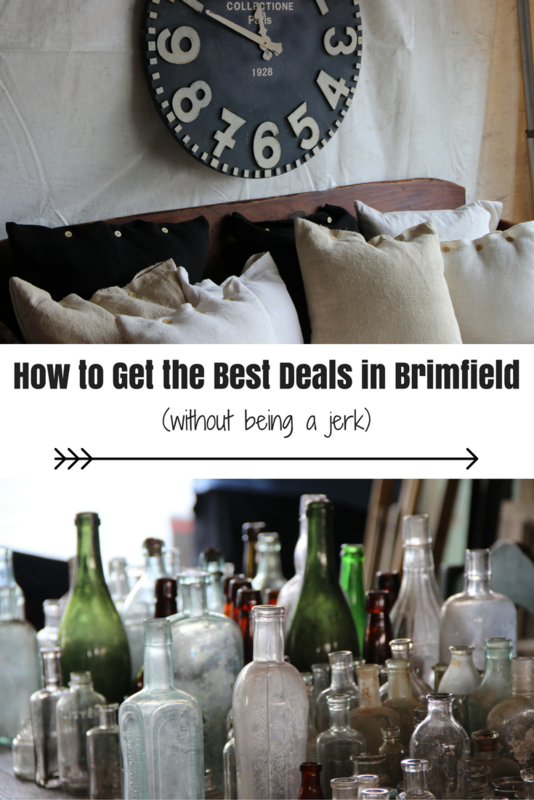 I have filled my home with #brimfieldfinds (click here to see some of them). Below are some of my tips on what to do and, just as importantly, what not to do to walk away with the item you want at a fair price without ruining someone’s day. DO have a rough idea of what you are willing to pay and be serious about buying the item before negotiating. If the asking price isn’t in the ballpark of what you are willing to pay, consider moving on or be up front about that from the beginning. As a general rule, dealers expect to come down at least 10-20% of their marked price. DO act friendly and to put it as simple as possible, just be nice. It doesn’t have to be a competition with a winner and a loser. They are selling an item you want to buy. How nice that you found each other! You don’t have to swap life stories (although I’ve seen it happen) but some friendly conversation doesn’t hurt. What’s your best price on this? Would you be willing to take x? DO bundle. The more you buy the happier they will be to discount. DO pay in cash but don’t expect it to get you a better price. Most dealers only accept cash (that’s starting to change but slowly) so it doesn’t really sweeten the deal as much as it would in other venues. DO shop the last day for some good deals. This isn’t a hard fast rule but generally dealers will discount something a bit more to avoid packing it up and bringing it home (especially if it’s big and heavy). But don’t expect them to be giving stuff away. Many dealers have stores to go back to or another show right around the corner so they aren’t desperate to get rid of things. DON’T offer half (or less than half) of the marked price. I’ve seen people recommend starting at half as a bargaining strategy. I don’t recommend this. It rubs dealers the wrong way. They still might make a counter offer or they just might decide you aren’t the kind of shopper they want to give an extra good price to. DON’T be rude. I know I said this above, but it bears repeating: just be nice. Most Brimfield dealers are there because they are really good at what they do. A lot run reputable businesses back home and use Brimfield to make connections and shop for new merchandise. Don’t assume they are all desperate for each and every sale. Waving a $20 bill in their face (I have seen this happen) is condescending and probably won’t get the reaction you’re hoping for. DON’T walk away and expect the item to be there when you return. Sometimes hesitating or walking away can work in your favor. The dealer might come down a little bit more to make the sale but you also might miss out on the item entirely. Merchandise moves fast in Brimfield, particularly early in the show so don’t walk away if it’s something you really want. You might not see it again. Finally, DO have a great time treasure hunting! See you there! If you’re heading to the Brimfield Antique Show, be sure to download the FREE Brimfield Flea Finder app to help you navigate the show! Get show info, search for specific dealers and items, locate food, bathrooms, ATMs and more! Agreed! Thanks for taking the time to comment! Additionally, DO NOT SEE THEIR PRICE, ASK THEIR BEST PRICE, AND THEN MAKE A LOWER OFFER (as some flea market experts may recommend). Also, treat them like they're a member of your family and that they need to make a living.